One of the determining factors about life in the U.S. Army on the frontiers of America was the small size of the force engaged in operations in relative isolation from the country and from the rest of the Army. The Army was scattered throughout hundreds of small forts, posts, outposts, and stations throughout the American West, often with little more than a company of cavalry or infantry in each post. This isolation bred, on one hand, a strong sense of camaraderie, of bonding, within the Army in a way that only shared suffering can do. The officers and men often felt part of an extended family that had to look inward for strength as it relied on its own customs, rituals, and sense of honor separate from that distant civilian world or even from the very different military society “back East.” This sense of unity, of “splendid isolation,” kept the Army as an institution together during the harsh missions of western frontier duty but, at the same time, led far too often to professional and personal stagnation. Promotion was slow, and chances for glory were few, given the dangers and hardships of small-unit actions against an elusive foe. The isolation also bred a certain measure of reliance upon each other, as officers and soldiers developed various customs and rituals to bring structure to their lives. The formal rituals of a frontier post — life regulated by bugle calls, formal parades, Saturday night dances for the officers, distinctive uniforms, and unit nicknames — were attempts to deal with the tensions and pressures of a harsh life for a soldier and his family with low pay and little prestige. While perhaps glamorous in retrospect, or when seen through the eye of Hollywood movies, such small communities also had their share of drunkenness, petty squabbles, corruption, arguments over rank and quarters, and other seemingly minor disputes so well known by any who have experienced life in small-town America. It was a life at once dangerous and monotonous, comradely and isolated, professionally rewarding and stultifying. With low pay, poor quarters, an indifferent public, and a skilled foe that was at once feared, hated, and admired, the officers and men of the frontier Army seemed caught in a never-ending struggle with an elusive enemy and their environment. One historian summarized the Army post during this period on the frontier this way: “If one description could alone fit all frontier posts , it would be a monotonous routine relaxed only slightly by the color of periodic ceremony.” This shared culture created many of the institutional myths and customs that continue to influence the Army’s image of itself to this day. The manpower strains of all the various missions after the Civil War plus manning all the frontier posts and stations badly strained the resources of a shrinking Regular Army. As the post-Civil War Army took shape, its strength began a decade of decline, dropping from an 1867 level of 57,000 to half that in 1876, then leveling off at an average of 26,000 for the remaining years up to the War with Spain. Effective strength always lay somewhere below authorized strength, seriously impaired by high rates of sickness and desertion, for example. Because the Army’s military responsibilities were of continental proportions, involving sweeping distances, limited resources , and far-flung operations, an administrative structure was required for command and control. The Army was, therefore, organized on a territorial basis, with geographical segments variously designated as divisions, departments, and districts. There were frequent modifications of organization, rearrangements of boundaries, and transfers of troops and posts to meet changing conditions. Development of a basic defense system in the trans-Mississippi West had followed the course of empire. Territorial acquisition and exploration succeeded by emigration and settlement brought the settlers increasingly into collision with the Indians and progressively raised the need for military posts along the transcontinental trails and in settled areas. The annexation of Texas in 1845, the settlement of the Oregon boundary dispute in 1846, and the successful conclusion of the Mexican-American War with the cession to the United States in 1848 of vast areas of land, all had drawn the outlines of the major task facing the Army in the West in the middle of the 19th century. During the period between the Mexican and Civil Wars, the Army had established a reasonably comprehensive system of forts to protect the arteries of travel and areas of settlement across the frontier. At the same time, the Army had launched operations against Indian tribes that represented actual or potential threats to movement and settlement. Militarily successful in some cases, these operations nevertheless hardened Indian opposition, prompted wider provocations on both sides, and led to the delineation of an Indian barrier to westward expansion extending down the Great Plains from the Canadian to the Mexican border. Brigadier General William S. Harney, for example, responded to the Sioux massacre of Lieutenant John L. Grattan’s detachment with a punishing attack on elements of that tribe on the Blue Water in Nebraska in 1855. Farther south, Colonel Edwin V. Sumner hit the Cheyenne on the Solomon Fork in Kansas in 1857 and Brevet Major Earl Van Dorn fought the Comanche in two successful battles, at Rush Spring in future Oklahoma and Crooked Creek in Kansas in 1858 and 1859, respectively. The Army on the Great Plains found itself in direct contact with a highly mobile and warlike culture that was not easily subdued. In the Southwest, between the wars, Army units pursued the Apache and Ute in New Mexico Territory, clashing with the Apache at Cieneguilla and Rio Caliente in 1854 and the Ute at Poncha Pass in 1855. There were various expeditions against branches of the elusive Apache that involved hard campaigning but few conclusive engagements such as the one at Rio Gila in 1857. It was in this region in 1861 that Lieutenant George N. Bascom moved against Chief Cochise, precipitating events that opened a quarter century of hostilities with the Chiricahua Apache. In the Northwest, where numerous small tribes existed, there were occasional hostilities between the late 1840s and the middle 1860s. Their general character was similar to operations elsewhere: settler intrusion, Indian reaction, and U.S. Army or local militia counteraction with superior force. The more important events involved the Rogue River Indians in Oregon between 1851 and 1856 and the Yakama, Walla Walla, Cayuse, and other tribes on both sides of the Cascade Mountains in Washington in the latter half of the 1850s. The Army, often at odds with civil authority and public opinion in the area, found it necessary on occasion to protect Indians from settlers as well as the other way around. The Regular Army’s frontier mission was interrupted by the onset of the Civil War, and the task of dealing with the Indians was transferred to the volunteers. 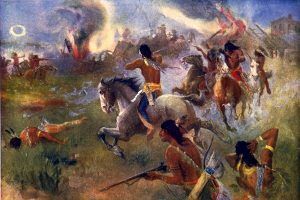 Although the Indians demonstrated an awareness of what was going on and took some satisfaction from the fact that their enemies were fighting each other, there is little evidence that they took advantage of the transition period between removal of the regulars and deployment of the volunteers. The so-called Great Sioux Uprising in Minnesota in 1862 that produced active campaigning in the Upper Missouri River region in 1863 and 1864 was spontaneous, and other clashes around the West were the result not of the withdrawal of the Regular Army from the West but of the play of more fundamental and established forces. The volunteer units were in many instances commanded by men of a very different stamp than were Regular Army units. In one instance, a Colorado volunteer cavalry unit, commanded by a volunteer colonel named John M. Chivington, attacked and massacred several hundred peaceful Cheyenne Indians at Sand Creek, Colorado in 1864 in one the worst atrocities of the western wars. There were dangers in relying on volunteer units in this essential peacekeeping role. In any case, by 1865 overall Army strength in the frontier departments was about double what it had been in 1861. The volunteers kept pace with a continuing and gradually enlarging westward movement by further developing the system of forts their predecessors had begun. The regional defense systems established in the West in the 1850s and 1860s provided a framework for the deployment of the Army as it returned from the Civil War to its frontier responsibilities. In the late summer of 1866 the general command and administrative structure for frontier defense comprised the Division of the Missouri, containing the Departments of Arkansas, Missouri, Dakota, and the Platte; the Division of the Pacific, consisting of the Departments of California and the Columbia; and the independent Department of the Gulf, whose area included Texas.However, by 1870 the Division of the Pacific included the Departments of the Columbia, California, and Arizona and the Department of the Missouri covered the Departments of the Dakota, the Platte, and the Missouri; the Department of Texas was included in the Division of the South. The Army’s challenge in the West was one of environment as well as adversary, and in the summer of 1866 Ulysses S. Grant sent a number of senior-officer inspectors across the country to observe and report on conditions. The theater of war was uninhabited or only sparsely settled, and its great distances and extreme variations of climate and geography accentuated manpower limitations, logistical and communications problems, and the difficulties of movement. The extension of the rail system only gradually eased the situation. 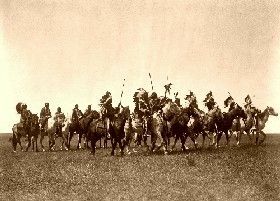 Above all, the mounted tribes of the Plains were a different breed from the Indians the Army had dealt with previously in the forested areas of the East. Despite the fact that the Army had fought Indians in the West in the period after the Mexican War, much of the direct experience of its officers and men had been lost during the Civil War years. Until frontier proficiency could be reestablished the Army would depend on the somewhat intangible body of knowledge that marks any institution, fortified by the seasoning of the Civil War. Of the officers who moved to the forefront of the Army in the Indian Wars, few had frontier and Indian experience. At the top levels at the outset, Grant had had only a taste of the loneliness of the frontier outpost as a captain. William T. Sherman had served in California during the 1850s but had not been involved in fighting. 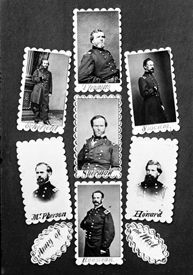 Philip H. Sheridan had served about five years in the Northwest as a junior officer, but neither Nelson A. nor Oliver O. Howard had known frontier service of any kind. Wesley Merritt, George A. Custer, and Ranald S. Mackenzie all had graduated from West Point into the Civil War; and John Gibbon had only minor involvement in the Seminole War and some garrison duty in the West. Alfred Sully, also a veteran of the Seminole War and an active campaigner against the Sioux during Civil War years, fell into obscurity, while Philip St. George Cooke was overtaken by age and Edward R. S. Canby’s experience was lost prematurely through his death at Indian hands. Christopher Augur, Alfred H., and George Crook were among the few upper-level Army leaders of the Indian Wars that had pre-Civil War frontier experience. Thus, to a large degree the officers of the Indian Wars were products of the Civil War. Many brought outstanding records to the frontier, but this was a new conflict against an unorthodox enemy. Those who approached their new opponent with respect and learned his ways became the best Indian-fighters and in some cases the most helpful in promoting a solution to the Indian problem. Some who had little respect for the “savages” and placed too much store in Civil War methods and achievements paid the penalty on the battlefield. Captain William J. Fetterman would be one of the first to fall as the final chapter of the Indian Wars opened in 1866. Compiled and edited by Kathy Weiser/Legends of America, March, 2017.